Automatic Riveting Machines Spare Parts mainly include Die, Puncher, Clamp. Normally, if under good maintenance(see How to maintenance riveting machines and eyeleting machines? ), the riveting machines will run in good condition around 10 years. Because of there are very few easy-worn parts on the riveting machines, most of the machine parts are non-strength status. As our experience and customers feedback, they are easy to replace if worn, there is no need for any training on replacing them. Why Die, Puncher, Clamp is easy-worn parts? 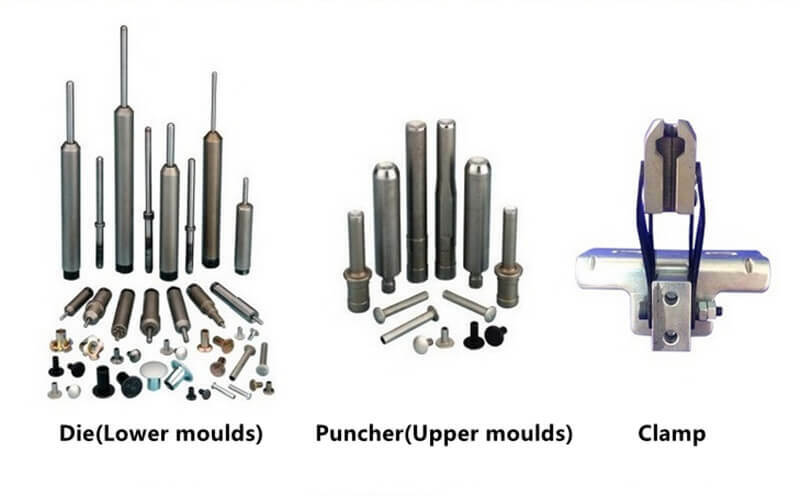 Die, Puncher, Clamp is easy-worn parts, due to these 3 parts are contacting rivets directly and doing riveting process continuously. What is the material of spare parts? Spare parts adopt alloy steel KD11 material, with hardening heat treatment. How is the life of spare parts?